Here’s a re-post from Daily Finance, with some promising, happy thoughts. A New York Times Sunday business section headline sums up the news coming from Washington over the past few months in a question: “Is a Food Revolution Now in Season?” As most question-mark headlines go, the article doesn’t answer much, but does bring a wide number of recent news makers into focus on the central theme, will Congress ever be persuaded to act on the growing sentiment to focus on local food systems, organic foods, sustainable agriculture and to slay the all-powerful corn and soy subsidies that give us commodity food (in other words, junk food whose production is terrifically profitable for Monsanto (NYSE: MON) and Archer Daniels Midland Co. (NYSE: ADM))? The only answer seems to be that, whatever else is true, the Obamas, Secretary of Agriculture Tom Vilsack, and many members of Congress are listening to Michael Pollan. 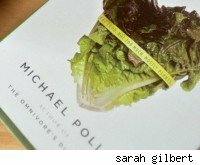 According to the NYT: “a prominent food industry lobbyist who requested anonymity because he wasn’t authorized to speak to reporters said he was amazed at how many members of Congress were carrying copies of “The Omnivore’s Dilemma.””What’s more, Obama himself supposedly read the entirety of Michael Pollan’s enormous and demanding letter to the “Farmer in Chief,” published in the New York Times Magazine in October 2008. While Obama’s personal food choices are certainly not the ideal of any food leaders (a 60 Minutes clip shows him making tuna fish sandwiches with supermarket white bread; an aide said his favorite “foods” are Nicorette, Met-RX bars, and Dentyne Ice gum), it’s clear that his wife and mother-in-law are forcing the issue of setting food policy, with their White House vegetable garden (featuring lettuce galore, peas, spinach and kale), their selection of a quietly anti-GMO activist, Sam Kass, as White House assistant chef, and many public comments about how important seasonal vegetables and fruits are for children. While a considerable and vocal minority of the public seems to have caught up the idea of reviving the Victory Garden, and Vilsack with his “People’s Garden” is a fervent champion of the idea of local food, having stated publicly that he wants to encourage farmers to develop regional food networks; he also hopes to devote more resources to child nutrition to improve the quality of school breakfasts and lunches, and to ensure that only healthy choices are available in school vending machines. These are not the priorities of the food lobby, and these are not the priorities of Congress, who just passed a five-year Farm Bill with few changes to the status quo of big subsidies for big monoculture crops — the bread and butter of Monsanto and ADM — and expressed anger at the proposed budget, which would cut subsidies to the nation’s largest farmers and bolster child nutrition payments. Or aren’t they? Behind closed doors, our government’s officials are reading Michael Pollan; they’re screening the documentary “Food Inc.”; which is what the New York Times calls “a withering critique of agribusiness and industrially produced food.” Times, they might be a-changin’. Thus far, it’s hard to tell if fear of changing food politics has had any affect on the love investors feel for Monsanto and ADM. While profits are just fine, and the companies both predict better-than-market-average growth prospects for the next several years, their P/E ratios are very low; ADM, despite projecting growth at 15x earnings, is hovering at a P/E of 7.35. But they’re not showing any different trajectories than the rest of the market’s stocks. At stock prices not seen since August of 2007, when the Dow was on its upward climb — Monsanto closed Friday at $80.35, and ADM at $27.44 — these stocks seem a bargain, like the rest of the companies that make up the NYSE’s biggies. And though the political sentiment of foodies is that Monsanto is a trust in need of busting (after all, the company owns 99% of the market of soy and corn seeds, a truly frightening state of affairs for two of the world’s biggest crops), the sentiment of the rest of the investing public seems to be that of the Food Lion shopper mentioned by columnist George F. Will; in other words “I’m not listening I’m not listening nanananana.” Monsanto has a 16.91 P/E ratio; higher than most all of the DJIA components; and either that is willful disbelief in the ability of sustainable food advocates to change the world, or a simple hope in the power of the short term. It’s not where I’m putting my money; I’m investing in vegetable gardens and a CSA grass-fed beef share; but I am, like the organic foods market, part of a very, very small minority.